Not everyone has as much space as they would like but they have multiple items they want to keep. So, in these situations, what do you do? Extra space can be hard to find in your already decorated home. While your garage, attic, closet, and basement may be a choice, they are already likely being used and if they are, you really have nowhere else to put any items. If your home is on the border of looking like a hoarder’s house or like you stuffed as much as you could into one place, it is time for you to consider a storage unit. Whether you plan to move, need some extra room, or are downsizing, a self-storage unit is a great option and can provide you with the space you need. No matter what, you will find that self-storage is affordable, versatile, and can meet your needs. Below, we will talk about what self-storage is, why you may need it, what unit sizes are available, and answer some of your most commonly asked questions. Self-storage is an option available to individuals where a business leases out space to store their items. Typically, a business or individual will receive a unit, which is an enclosed space protected by three walls and a door that roll up and down for easy access. Often, people will refer to self-storage as simply storage, public storage, or mini storage. Storage units come in several different sizes that you can choose from and they have a locking mechanism that allows individuals to attach a lock of their choice to secure their belongings. While you do rent a unit, the leases on these units are not as strict or stringent as an apartment. In fact, almost anyone can lease a storage unit and you can get into one for an affordable price and use it as you need it. Therefore, you are not locked into a contract for any length of time and can use it for a month and leave or use it for several years. Self-storage is often used interchangeably with other storage terms and types, which can confuse those who are searching for a storage solution. First, self-storage is often confused with storage lockers, but the two are not the same. A storage locks is a place to store your belongings but on a much smaller scale. These types of lockers are often found inside of storage units, but they are not nearly the same thing. Secondly, individuals often refer to storage sheds as self-storage, but they are not the same. A storage shed appears on an individual’s property and the individual can purchase one already built or assemble it on their own. These types of storage options do not cost anything additional other than the initial price to purchase it. Sheds are not a self-storage option, but they are an alternative to self-storage. Typically, the only time you benefit from a storage shed is if you need to store items permanently or for a long period of time such as lawn tools, etc. 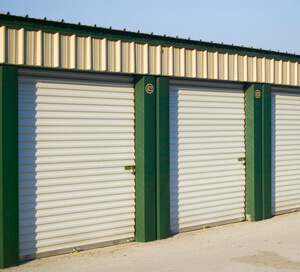 Self-storage has become quite commonplace and you can drive around and see multiple facilities. It is not as scarce as it used to be and there are many reasons why someone may need to rent out a self-storage unit. Let’s look at those reasons now. A home renovation or remodeling project is exciting, but it can stir up a lot of dust in the home and your furniture may be in the way. A self-storage unit is an excellent way for you to open the space that is needed for the remodel and keep your items free from dust and dirt. The most common reason people lease a storage unit is because they need to store their items as they make a move. The moving process is never simple, and it takes planning and strategy. Whether your home is not ready for you yet or you have some items that just don’t fit, a self-storage unit can provide you with that extra space you need for the time being. As a student, you are likely going to have breaks in between your semesters or you may want to head home for the summer. However, you do not want to bring all your items with you and then must bring them back again. Self-storage is a great option when you want a couple months away from school but do not want to pack up and head home. It can be difficult to get rid of items, especially if you move into a smaller home. If you take all your belongings, you will instantly feel cramped. Sometimes, even when downsizing, you do not want to toss out some of your items, so you may want to lease a self-storage unit to help you keep some of those precious heirlooms or items until you decide what to do with them. If you have ever been taken on a roller coaster of ups and downs, you know that an emergency can happen at any time. Self-storage is wonderful in these situations as it allows you to handle what is most important at that moment without worrying what will happen to your belongings. Whether there was a death in the family, a loved one needs you to move in and become a caregiver, or a natural disaster strikes, self-storage is available and can meet your needs in these situations. Selling your home is difficult in and of itself but when you add your belongings to the mix, it becomes that much more difficult. Staging your home is an important step in the selling process and this means you need to get rid of your most personal items and belongings. If you have not sold your home yet or purchased a new one, you may not have any place to store your items. In these situations, a self-storage unit can help and provide you with the space you need. What Size Units Are Available? Once you know what you want to store, you will need to make sure you choose a unit size that meets your needs. There are several choices available and, in most cases, you can find exactly what you need. A rule of thumb to keep in mind is that if you are unsure if the unit you are considering is too small, go up one size. You would rather your items fit nicely instead of them being cramped. Remember, if you stuff your unit full without any organization or room to move around, you will not be able to access your items. Below, we will explore the available unit sizes and discuss what type of contents you can fit inside to give you a better idea of which size you may need. A 5x5 unit is approximately 25 square feet in size and is equivalent to the size of a closet. Within this unit, you can store several items such as a small bookcase, night stands, coffee tables, a small mattress with box spring, small appliances, and chairs. A 5x10 unit is approximately 50 square feet in size and is equivalent to the size of a larger walk-in closet. You will find it has a bit more space then the smaller 5x5 unit, which may be just enough for you to store several extra items. Within this unit, you can store items such as a small couch, small bedroom set, boxes of items, dresser, night stands, small appliances, and yard equipment. A 5x15 unit is approximately 75 square feet and is usually longer than it is wide. It is not a common size, but some facilities do offer it. Within this unit, you will be able to store more narrow than wide items such as mattresses, dressers, filing cabinets, ladders, bookcases, and boxes. A 10x10 unit is approximately 100 square feet and is the size of a small bedroom. Within this unit, you can store items from about one to two bedrooms depending on the size. You can store items such as multiple chairs that are stacked up, a few large appliances, bedroom sets, coffee tables, small couch or loveseat, and office supplies. A 10x15 unit is approximately 150 square feet and is equal to the size of a traditional bedroom. Within this unit, you can store items from a two-bedroom home comfortably. Some of the items that will fit include electronics such as televisions, computer desks, bedroom furniture, living room sets, motorcycles, ATVs, small cars, yard equipment, and appliances. 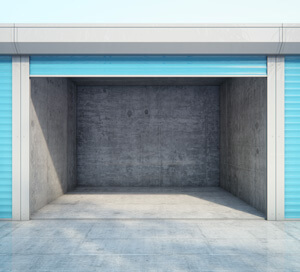 A 10x20 unit is approximately 200 square feet and is equivalent to a one-car garage. Within this unit, you can comfortably store a two to three-bedroom home. Some of the items you can fit inside include complete bedroom sets, large tool boxes, boxes, dining room and living room furniture, washers and dryers, office equipment and furniture, and small cars or SUVs. A 10x25 unit is approximately 250 square feet in size and is equal to a standard one car garage. Within this unit, you can store items from a three-bedroom home comfortably. Some of the items you can store include lawn equipment, boxes, bedroom sets, complete furniture sets throughout the home, home décor, appliances, and patio furniture. A 10x30 unit is approximately 300 square feet and often the largest sized unit available at self-storage facilities. You can store the contents of a four-bedroom home within and the unit is the size of a two-car garage. Some of the items you can store include everything from the units above, large office furniture or machinery, and two vehicles. What Types of Items Can Be Stored in a Self-Storage Unit? A storage unit is a place for you to store items and you can store almost anything you want within your unit. Fortunately, most storage unit facilities allow you to store your belongings without a problem if you do so within reason. Below, we will talk about some of the items you CAN keep within your storage unit. You can store electronics within your storage unit and some of the most commonly stored electronics include televisions, DVD players, Blu-ray players, radios, cameras, and more. It is vital that you do take extra time to properly pack and store these items as they are vulnerable to humidity and extreme temperature changes. It is recommended that you have a climate-controlled unit. One of the most commonly stored items in a storage unit is furniture. The unit is ideal for storing your chairs, bedroom sets, couches, and more. It is important that you make sure to choose a climate-controlled unit for your furniture so that the wood does not wear down or become brittle due to extreme weather changes. In addition, you do not want mildew to develop on the cushions or pillows due to humidity. Books and files can be stored in your self-storage unit and are safe to store as well. You can store these items in either boxes, special file protectors, or in a filing cabinet. While you do not have to store these items in a climate-controlled unit, it is often recommended to avoid issues with mildew on the pages or paper. You can safely store clothing in your storage unit and many people do it. Clothing can be stored on a rack, in a box, or a specially designed bag. You may want to place the clothes in a climate-controlled unit to avoid mildew due to high levels of humidity. You may find yourself needing to store appliances during a move or home renovation project. You can safely store ovens, dishwashers, ice makers, wine fridge, stove top, washer and dryer and even refrigerator. Be sure to wrap and pad them so that when they return to your home or their new location, they are in as good condition as they were when they went into store. A storage unit is a perfect place to store lawn equipment and garage items such as construction tools, saws and gardening tools. Be sure to follow the instructions of the self-storage facility on how to properly store these items in your unit so that they don’t have issues down the road and you don’t violate any of the rules at the storage facility. What Items Should Not Be Stored in a Self-Storage Unit? 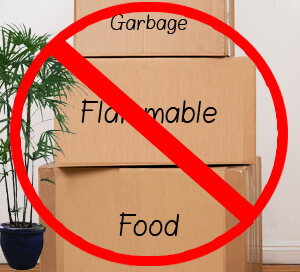 While you can store almost anything within your storage unit, there are some items that you should NEVER store within them and many of these items are on the prohibited list in your lease. Plants will not survive in a storage unit because they require light and water. Since you will not likely be visiting your unit daily, your plants will not make it. If you want to store artificial plants, you can do so. NEVER store pets inside of your storage unit, whether it is climate controlled or not. A storage unit is not a place for your pet and your pet may become ill or die as a result. You should find a kennel or pet sitter to watch your furry friend as you move or go out of town. Your self-storage unit is not a place for you to live and to do so is considered illegal. It is important to only use the storage unit as intended. Never store garbage in your storage unit as it is not an appropriate place to do so. The garbage will spoil and start to smell and attract pests to your unit and those nearby. Food in cans can be stored in your storage unit. In fact, food that is considered non-perishable can be stored but anything else should NOT be stored. You should avoid storing candy, chips, or any other food that can spoil. The reason behind this is because the spoiled food can rot and start to smell, as well as, attract pests. Finding a local self-storage unit is not difficult and you can probably find one within minutes of being on the road. While self-storage facilities are plentiful, you do want to take some time to consider the amenities you want the storage facility to have. In fact, while you may not think these amenities matter, they can improve your storage experience and give you the peace of mind you need when it comes to security. For convenience purposes, a drive-up access unit is a must. These types of units are in a single-story building that is outside. These units allow you to drive right up to your unit number, which makes loading and unloading your vehicle simple and easy. These types of units are perfect if you do not need a climate-controlled unit and you want to be able to load and unload without much walking involved. While these units are convenient, they lack some of the amenities you would receive if you rented an interior unit, but the price difference is notable. A climate-controlled unit is recommended for many of your belongings you plan to store from clothes to jewelry to furniture. If your items must be kept from extreme temperature changes, then you want to lease a unit that is climate controlled. Humidity is one of the most common reasons for mold in addition to moisture. With that said, you should find a facility that offers humidity control too. You may want to search for a storage facility that offers electricity in the units. When you think electricity, you may be thinking AC and lights, but we are referring to units that have electrical outlets. This is a nice amenity, but not all storage facilities offer it. If they do, you can expect to pay extra per month in most cases. Often, storage facilities limit when you can access your unit, so you may find that most facilities are open from 6:00 am until about 8:00 pm or somewhere around there. If you work and cannot make it to the facility during these times, you will either need to call off or spend your weekend at your storage unit. This is not convenient for most people. If you need additional hours or you do not want to be limited in access to your unit, you should look for a facility that offers 24/7 access to the unit. Below, you will find some commonly asked and answered questions about self-storage units and renting one. How often does the rent change on the storage unit I am leasing? This is a good question. Typically, when you lease a storage unit, you will be told the rate per month. You will also be informed as to whether this rate is locked in for a specific duration or if the rate is flexible. Most storage units operate with flexible rates, which means that the rent can increase when the market calls for it. Of course, the facility would need to let you know and if you are worried about the cost of rent rising, speak with the facility manager to learn more. What types of specials or discounts are available for self-storage units? Each storage facility will run their own specials and discounts which means you may find that one facility has cheaper rent than the other. Some of the most common discounts include move-in specials, free month of rent, and pro-rated rent. What factors will influence the cost of my storage unit? Special features such as climate control, humidity control, drive-up access, etc. Can I move out of the unit whenever I want, or can I upgrade or downgrade to a different size unit? Yes. You are not locked into a lease for a specific number of months and can move out when you are ready. You can also upgrade or downgrade to a different size unit as needed. How will I know all my stuff will fit through the storage unit door? All the doors on storage units are roll up doors like a commercial company’s intake area where they receive shipments. The doors roll completely up, and the unit is the size of a garage door or close to it. In fact, depending on the unit size you rent, the width will be about that size. To access and use the door on your unit, you will find a latch on the front and all you need to do is slide the latch and raise the door. Once you have stored items in the unit, you can lock and secure the unit. There are not swing open doors on storage units, so you do not have to worry about the constant opening and closing, the limitations of a swing door, or the door getting in the way. Will my storage unit have electrical outlets? It depends. Some storage facilities do offer electrical outlets in their units but not all do. If you are looking for an electrical outlet within your storage unit, inquire around town and find out who offers them. Previously, you could locate a self-storage unit by looking in the phonebook, but today, you can perform a search online for a self-storage unit nearby or you can travel down the road and spot them. Since self-storage units are plentiful, you want to weed out the right facility based on the amenities they offer and how well they can meet your needs.